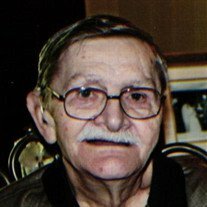 Emmett E. Gentry, 84, of Cabot, Arkansas, passed away November 16, 2018 at Baptist Hospital in Little Rock, Arkansas. He was born February 26, 1934 in Benton, Arkansas to Wakley and Myrtle Gentry. Mr. Gentry was a United States Army Veteran, had an honorable discharge and was a member of the American Legion. He retired from Safeway as produce manager. He enjoyed the outdoors, gardening, birds, cats, dogs, and plants. He is preceded in death by his parents, Wakley and Myrtle Grant Gentry; one son, Eugene Gentry; two brothers, Nolan Gentry and J.W. Gentry; and one sister, Janice Wise. He is survived by the love of his life, Betty Glosson Gentry, whom he was married to for 63 years; one daughter and son-in-law, Tamya and Donny Newberry, of North Little Rock; two sisters, Elma Jean Raper, of Benton, and Phyllis Howe, of Lonsdale; daughter-in-law, Kay Gentry, of Sherwood; three granddaughters, Donya Alexander, of North Little Rock, Michelle Crites and Carolyn Pinegar , of Nixa, Missouri; two grandsons, Brian Newberry, of Bryant, and Dusty Hankins, of Sherwood; five great-grandsons and a number of nieces, nephews, cousins and friends. We would like to give our love and appreciation to Eddie and Wanda Yarbrough and Byron and Moesha Foreman. Visitation will be held from 6-8 PM on Tuesday, November 20, 2018 at Smith-Sherwood Funeral Home, 7700 Hwy 107. A funeral service will be at 11 AM on Wednesday, November 21, 2018 at Christian Assembly of God, 10601 Hwy 107. Burial will be held at 9 AM, Tuesday, November 27, 2018 at Arkansas State Veteran's Cemetery, 1501 West Maryland Avenue.